Cheap-Chic Decor: Our Clock On Property Brothers! Our Clock On Property Brothers! 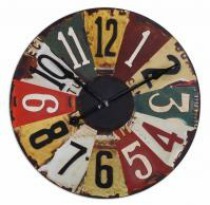 Saw our Uttermost 29" Multi Colored Vintage License Plate Wall Clock on a recent episode of HGTV's Property Brothers! They have good taste in accessories!